Meg Cowell is adding the finishing touches to another beautiful, seductive and ethereal exhibition, which will open at Flinders Lane Gallery on the 20th March. 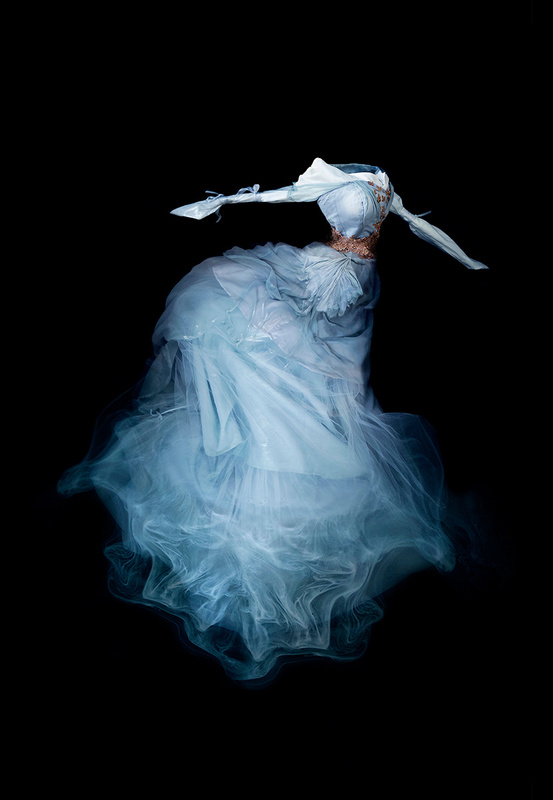 With her focus attuned to capturing the flow of silks, tulle and flower petals in the dark vastness of water, this body of work is immersive and captivating, presented as beautiful, glossy large scale limited edition archival prints. 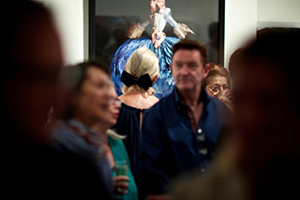 Cowell's exhibition places an emphasis on the relationship between her subjects. When viewed together, they weave something darkly beautiful. For this work Cowell has created a tightly related cast of characters, like dancers in a ballet or characters in a fairytale, whose movements and energy intertwine, creating a moving rhythm as they are viewed across the gallery wall. For these images Cowell has exaggerated the iconic aspects of her previous works; the skirts billow out like opening blooms and the palette is feminine with a selection of subdued and watery pastels. Cowell is fastidious with regard to the work's execution but not so serious that the elements of fun, make-believe and frivolity aren’t also pushed, along with a sense of sensuality and mystery. Coveted by renowned interior stylists and lovers of photography and fashion alike, her works are unique and collectable. 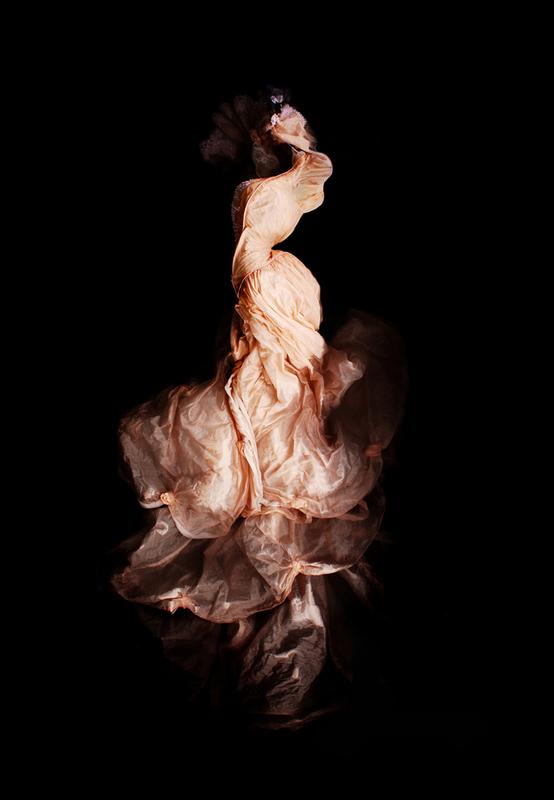 Melbourne based artist, Meg Cowell- photographs undulating feminine garments in what appears to be a vacuum of infinite space. Rich in hue and excessive in their skirting, the dresses are handpicked for their unique and romantic character. 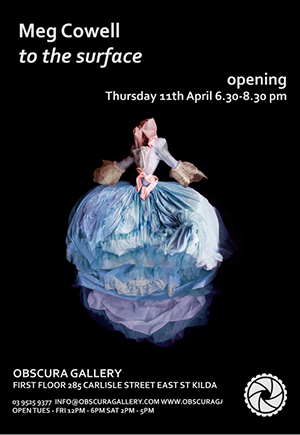 Cowell’s exhibition, Deeper Water, presents a series of large-scale photographic works that illustrate this shift from garment to artefact. Through sophisticated direction Cowell creates vignettes of unique gowns, lingerie and couture as they bloom into new forms. Dresses appear flower-like, floating in an abyss. Cowell describes the satisfaction when clothing abandons its inanimate physicality for a sense of agency: “I think an image is successful when it shows metamorphosis. Good images require an imaginative collaboration from the viewer to interpret what they are seeing.”The second chapter of the series features new work from Cowell; a sequence of youthful female bodies in contrast with cloth, flowers and liquids. For these Cowell has chosen garments that are strongly infused with nostalgia and melancholy, such as floating dresses with ruffled necklines and lacy shifts in antique silks. Through the suggestive, sensual qualities of these fabrics Cowell constructs a dream space of feminine fantasy and illusion. While the work is full of a deep sensuality, the feeling is constantly in conflict with an incredible sense of coldness; haunted and haunting. Milky waters seem almost deathly cold, suggesting mortality- the goose-pimpled flower of youth and the sinking fog of eternity. Historically, fashion has played an important part within the cultural and psychological rituals of transformation through birth, marriage and death. The institution of the white wedding dress is a potent example of the transformative properties of clothing; bodied as transformative phenomena and disembodied as relic. For this series I have made subjects of such garments, among others, to connect the viewer with the real and imagined atmosphere surrounding such rites of feminine transition. 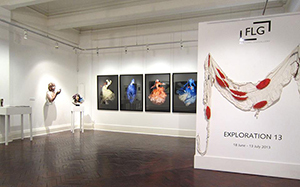 My use of water as a medium of buoyancy and illusionistic display situates the garments in a dream-space of fantasy and illusion and invites an important imaginative collaboration from the viewer- the water reveals and suggests further revelation. Twenty-five years and over 500 curated exhibitions later FLG is determined to celebrate this remarkable milestone with an exhibition that pays respect to the incredible city of Melbourne that has actively supported and nurtured our Australian artists for so long. Our represented artists have created an artwork specifically for the exhibition, based around the curatorial premise of representing Melbourne, and what our city means to each individual artist. This image is part of my ongoing series of photographic artworks depicting theatrical feminine costumes that have been arranged and illuminated while suspended in water. My interest for the series is to express the sensory and emotional values that are evoked by fabric, but also to explore a symbolic formality in dressing that has slipped out of meaning. The concept for this particular work is Melbourne’s Victorian era, which is so much a part of our cityscape, by representing mourning black and the emotion that is exteriorised by this type of fashion. Victorian era mourning dress is a potent instance of the symbolic power of clothing- after the death of her husband Queen Victoria spent more than forty years in black to symbolise her spiritual darkness. For this image, I wanted to relate the way our psychology and physical bodies are defined by our clothes, to the idea of architecture as a social emblem and expression of conventionality. Through my handling of the dress I was able to produce a formal and rigid structure that gives a sense of the some of the principles of architecture, while still expressing the private emotions of grief that are externalised by this type of fashion. Our Art Fair Stand C108 is partitioned into two gallery spaces highlighting the strong thematic running within the gallery stable. On the Dark end of the spectrum, these contemporary artists engage in the broadly defined genre of realism to create work that explores the darker shades of the human experience. 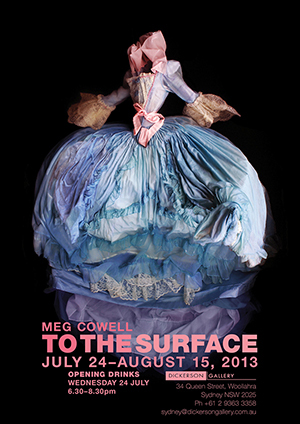 Meg Cowell photographs her subjects as they are immersed in an illusionistic display of the ephemeral. It is through this act of buoyancy that she enables to connect the viewer with the real and imagined atmosphere surrounding rites of feminine transition that situates her garments in a dream-space of fantasy and apparition. Provincial theatre playhouses are the fertile hunting ground of artist Meg Cowell in her ongoing quest for fantastical garments, theatre costume and couture. These garments, once collected, are arranged and illuminated while suspended in water. For this purpose Cowell has installed a 1000 litre pool in her country-town backyard, in which she suspends and arranges her subject, using water as a medium of buoyancy and illusionistic display. The objective for Cowell is to achieve a sense of the garments being inhabited, not only by their absent wearer, but also by a complex of moods, emotions, and constructs of the feminine. Meg Cowell exhibited as part of Exploration 13, FLG’s annual showcase of emerging and unsigned artists. The Josephine Ulrick and Win Schubert Photography Award is considered one of the most important annual surveys of contemporary Australian photographic practice. This highly anticipated award, with a total $30,000 in prizes and acquisitions, is a highlight of Gold Coast City Gallery’s exhibition program. From close to 300 entries, this year’s guest judge acclaimed New Zealand photographer Anne Noble has selected 65 finalists for display. 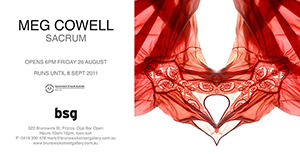 Group Photography Exhibition showcased works made during a 6 month residency in rural New South Wales. Adelaide’s freshest ARI Tooth and Nail Gallery showcased offerings from local artists Meg Cowell and Amy Herrmann to coincide with the opening of the 2012 South Australian Living Artists Week. The exhibition featured two individual bodies of work traversing the well-trodden landscape of feminine identity and transition. “The temple guardian of this subject matter in contemporary Australian photography is Deborah Paauwe, and we look to her and a few others for reasons to persist with these themes”, says Cowell. 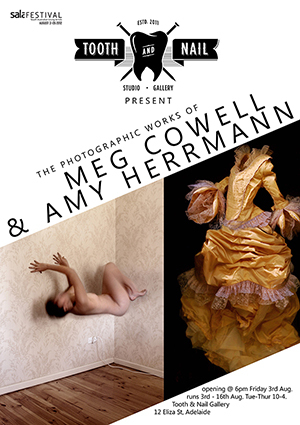 A.P Bond Gallery hosted new works by emerging photo-artist Meg Cowell in June. The exhibition featured photographs taken as part of the artist’s ongoing interest in collection and documentation of ‘found femineities’. 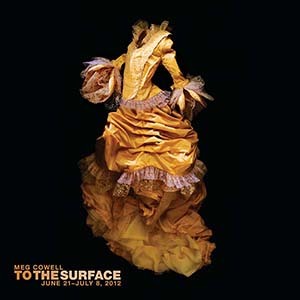 Ranging from discarded underwear and feminie garments to whole theatrical costumes, couture and wedding dresses- these items once collected are submerged and individually photographed. Sacrum represents the second chapter of my explorations into bilateral symmetry and the psyche which I began in 2005 with the series Rorschach. The x-rays offer a parallel element to the garments, presenting the viewer with the most internal and conversely external architecture of the human body.